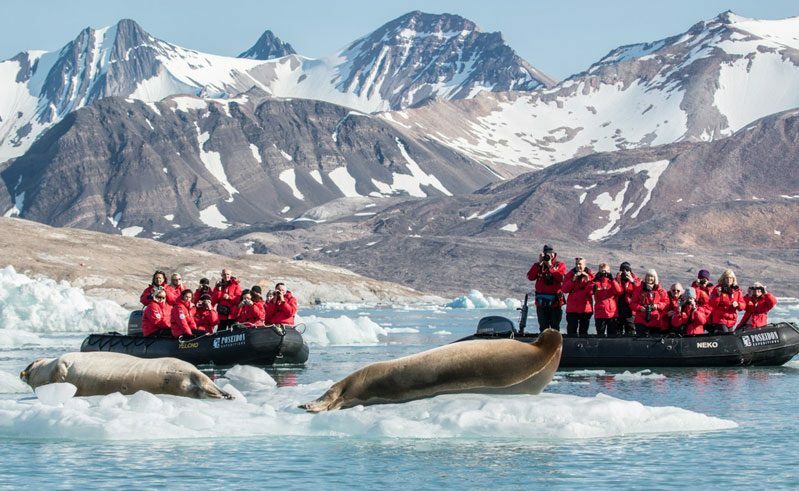 Polar voyages in the Arctic are a summer affair. Key destinations, like Svalbard, Greenland and the Canadian Arctic, are only accessible between June and September when enough sea ice has melted to allow exploration by ship. Weather permitting, you could fly to Longyearbyen in Svalbard, or one of the coastal settlements in Greenland, during early spring, but you would be restricted to a land-based trip. The fjords and bays are still choked with ice at this time, and it’s only during late spring – June – with long hours of daylight and warmer weather, that the sea ice melts sufficiently to enable polar voyages to get underway. At the start of the Arctic voyaging season, you may find that sea ice conditions still present a challenge. For example, a cruise attempting to circumnavigate Spitsbergen – the largest of Svalbard’s islands – might encounter thick pack ice in the north. All polar voyage itineraries are flexible to allow for sea ice and weather conditions, but especially so when you’re travelling early in the season. Generally, the midnight sun can be seen from mid-June to early July at the Arctic Circle. Further north, in Svalbard and parts of Greenland, the sun doesn’t set from April to August, while the North Pole has six months of midnight sun from late March to the end of September. The summer solstice on 21 June is the peak of the midnight sun season. During high summer in the Arctic, from late June through July, you’ll not only experience 24-hour daylight (and the midnight sun when it’s clear), but this is also prime time for seeing wildlife. Seabirds nest in their millions on sea cliffs in the Svalbard archipelago, while geese, swans and Arctic terns raise their young on the open tundra. Camouflaged in their brown summer coats, egg-raiding Arctic foxes are on the prowl, while polar bears can often be seen foraging along coasts and stalking seals hauled out on ice floes. Walruses are frequently encountered and there’s also a good chance of spotting various species of cetacean – from humpback, minke, fin and blue whales to narwhal, orca and beluga. During shore excursions, you’ll be able to tiptoe through the tundra, observing the profusion of delicate Arctic flowers that need to bloom and set seed during the brief Arctic summer. By August, there’s a sense of urgency in the seabird colonies as young prepare to fledge and fly south before the autumn arrives. The sea ice is now at its minimum extent, freeing up Spitsbergen’s west coast (with its high densities of polar bears), as well as Scoresby Sound in East Greenland and the Canadian Arctic’s Northwest Passage. When is the best time to see beluga whales in Hudson Bay? For an alternative to Arctic cruises during summer, Hudson Bay in Canada witnesses the annual arrival of over 60,000 beluga whales in July. 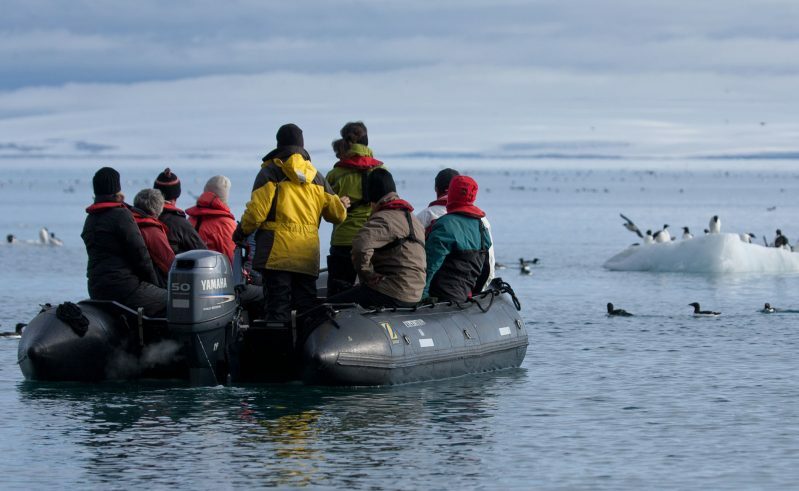 A land-based holiday here at this time is the perfect opportunity to take a boat trip to observe the natural spectacle – and even don a dry suit to snorkel with the white whales. The birdwatching is also excellent, and you might see polar bears hunting along the shores. During September, temperatures drop and the ice begins to re-form. Expedition ships will have left Svalbard at the end of August to sail towards Greenland’s east coast – September is an excellent month for a polar voyage here, with the added bonus of an early northern lights sighting. Throughout the Arctic, breeding birds are heading south to their warmer overwintering grounds, while polar bears start to search for den sites. By October, the polar voyage fleet has sailed south for Antarctica. Temperatures plummet as the days shorten. The summer frenzy of wildlife activity has long passed. Travellers heading for a land-based visit to Longyearbyen in Svalbard might glimpse ptarmigan or reindeer. 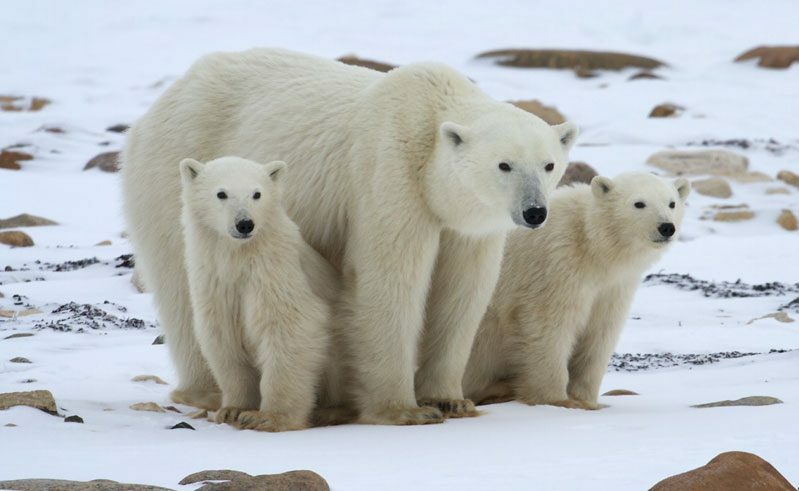 In the Canadian Arctic, however, the town of Churchill enters its busiest time of year as polar bears begin to congregate on the tundra shore, waiting for Hudson Bay to freeze over so they can hunt seals. A trip to Churchill during October and November almost guarantees sightings. Based in Churchill, you’ll set out to explore the tundra in giant-wheeled polar rovers which often provide close-up encounters with polar bears, as well as a chance to spot other wildlife, including Arctic fox, gyrfalcon and snowy owl. As the polar night sets in, the Arctic becomes largely inaccessible. To experience the region at this time of year, you need to head to Longyearbyen in Svalbard where there is a range of places to stay, as well as activities such as snowmobiling, husky sledding, snowcat tours and northern lights viewing. There is wide variation in temperature across the Arctic, influenced by ocean currents, solar radiation etc. Average July temperatures range from around -10°C to 12°C, while January temperatures vary from -34°C to 0°C. The average temperature of the Arctic has increased 2.3°C since the 1970s, leading some scientists to predict that, by 2050, the Arctic Ocean could be almost ice-free in summer.